Somehow squeezed in a trip from Ft Lauderdale to Savannah Georgia on 52 foot Tayana. Got to test iPhone navigation app by INavx. The navigation charts downloaded to the phone so you don’t need a cell signal to navaigate, just the GPS. And there is just so much to know, and Tayana Captain (friend) is a fantastic sailor. There’s so much to know on a boat and any time with someone who’s sailed probably 35,000+ miles is really like Gold. INavx worked well — hard to keep an iPhone on deck in wet environment though Aquapack can help. Still need a bigger electronic chart on the computer and ideally the same as what’s on the iPhone. Again ideally you’d want to plot waypoints on the bigger screen of laptop and upload them to iPhone, but can do on phone with patience. In any case, good to have another chart on board (and GPS). Just took ASA 105 which is kind of a throwback Navigation class — lots of pencils and erasers….but it all helps…especially blue water…harbors too. 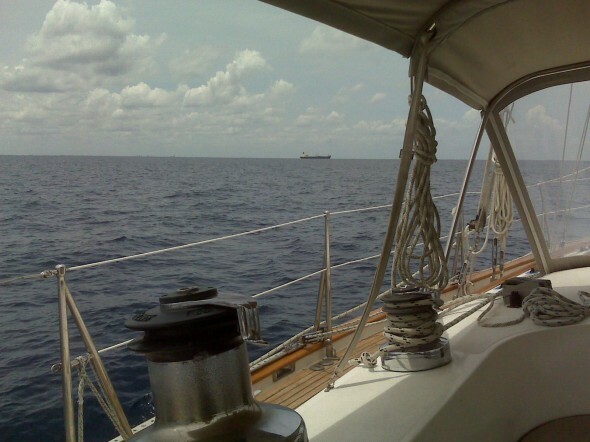 Trip was 400 miles — did 10 knots with the help of the Gulf Stream and was back at desk on Wednesday.